Les Payne, a retired editor and columnist at Newsday, replied to O'Reilly in an e-mailed rebuke, and DeWayne Wickham, USA Today columnist and dean of Morgan State University's School of Global Journalism and Communication, devoted his Tuesday column to the issue. Each is a former president of the National Association of Black Journalists. Payne wrote, "Linking Mr. Pinkston to 'jihadist terrorists' by virtue of working as a journalist for Al Jazeera TV is a misplaced assault upon the reputation of a solid professional and a good man you dared call 'a friend.' The offense is beneath the usual utterances from your media perch in the lower reaches. "Even if one were to accept your notion that Al Jazeera supports terrorists, Mr. O'Reilly, it does not follow that this particular reporter working for the network, ipso facto, is a supporter of terrorists. When your boss, Rupert Murdoch purchased the NY Post, I asked Columnist Murray Kempton how, given his impeccable journalistic standards, could he work for such a loathsome press baron. "It probably has never occurred to you, Mr. O'Reilly, that reporters have professional standards geared primarily 'to fulfill the public's right to know.' Most of them are guided in this Public Trust craft — protected by the First Amendment — in accordance with established values quite different from those of their owners. Indeed, media tycoons such as Murdoch, Mort Zuckerman and, perhaps those of Al Jazeera, are in business to make money and to advance political causes close to what passes for their hearts. . . ."
Payne also wrote, "As a rookie reporter, I worked for the previously, lily-white Newsday. The fact of my employment did not make me a racist, or a supporter of racists. . . . ."
Wickham wrote, "Lumping Pinkston and the other American journalists to O'Reilly's empty case against Al Jazeera — without real evidence of the network's wrongdoing, and none whatsoever of the journalists' complicity — stretches the notion of guilt by association beyond its reasonable limits. "It also slanders Pinkston — a good man O'Reilly shamefully calls his friend." On Friday's "The O'Reilly Factor," O'Reilly noted that Al Jazeera was the second-largest television network after the BBC. In a discussion with Fox Business Network reporter Adam Shapiro, O'Reilly said it "puts out all kinds of propaganda to help the terrorists. His commentary was prompted by a memo from Al Jazeera English executive Carlos van Meek, who told the DC and New York-based staff to avoid terms like "militants" and "terrorists." "One person’s terrorist is another person’s freedom fighter," he wrote, according to Evan McMurry, writing for Mediaite. "Avoid characterizing people. Often their actions do the work for the viewer." 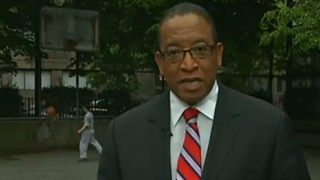 Pinkston, who left CBS News in 2013 after 33 years, resurfaced later in the year as a freelance correspondent for Al Jazeera America. "I could not possibly have penned such a powerful and eloquent response," he wrote Payne. "It would not have occurred to me to demand an apology." NABJ selected Al Jazeera America for its 2014 Best Practices Award, "presented to a news organization for exemplary work in covering issues of great significance to the black community or the African Diaspora and/or for its efforts in increasing diversity among its newsroom staff and management." "In the letter obtained by Media Matters, faith leaders and civil rights advocates admonished media outlets like Fox News for promoting 'divisive rhetoric' that misrepresents the Islamic faith and Muslims. Advocates criticized media outlets who falsely suggested that Muslim leaders failed to condemn the violence in Paris, promoted the profiling of Muslims, and parroted misinformation harmful to civic debate . . ."
The letter was signed by signed by the American-Arab Anti-Discrimination Committee, the American Center for Outreach, the American Muslim Advisory Council, Amnesty International USA, the Arab American Institute, Asian Americans Advancing Justice, the Center for Constitutional Rights, the Center for New Community, Color of Change, Muslim Advocates, the Michigan Muslim Community Council, the Muslim Public Affairs Council, the NAACP, the National Network for Arab American Communities, the New Evangelical Partnership for the Common Good, the Sikh American Legal Defense and Education Fund, South Asian Americans Leading Together, T'ruah: The Rabbinic Call for Human Rights, The Interfaith Center of New York and UNITED SIKHS. Charles D. Ellison, The Root: How Exactly Do We Get Rid of Boko Haram? Charlotte Lytton, Washington Post: Boko Haram is just as vicious. Why does the Islamic State get all the headlines? "The continuing plight of Al Jazeera journalists Baher Mohamed and Mohamed Fahmy must not be forgotten as their colleague Peter Greste is deported from Egypt," Amnesty International declared Sunday from London. "The organization has been calling for the immediate and unconditional release of all three men since their arrest in December 2013.
" 'The news that Peter Greste will finally be allowed to leave Egypt after more than a year in prison comes as a welcome relief, but nothing can make up for his ordeal. It is vital that in the celebratory fanfare surrounding his deportation the world does not forget the continuing ordeal of Baher Mohamed and Mohamed Fahmy who remain behind bars at Tora prison in Cairo,' said Hassiba Hadj Sahraoui, AmnestyInternational's Deputy Director for the Middle East and North Africa. "Peter Greste, an Australian national, and Mohamed Fahmy, a dual Egyptian-Canadian national, had sought deportation under new Egyptian legislation that permits the transfer of foreign nationals to their home countries to face trial or serve their sentences in cases of the 'highest interest of the state.' The men's arrest had caused an international outcry. . . ."
"An estimated 114.4 million people watched New England's thrilling win over Seattle on Sunday in Super Bowl XLIX, making it the fifth time in six years that a Super Bowl game has set a record as the most-watched event in U.S. television history," David Bauder reported Monday for the Associated Press. "The Nielsen company said the game's viewership exceeded the record of 112.2 million set last year, when Seattle beat Denver. "The game also set records for social media reach. A stirring comeback by New England and game-saving interception in the final minute kept viewers glued to the set." "The halftime show with Katy Perry, Lenny Kravitz and Missy Elliott also set a record with 118.5 million viewers,outgaining last year's show by 3% featuring Bruno Mars and the Red Hot Chili Peppers," Tim Baysinger added for Broadcasting & Cable. . . . ."
While the victory of the New England Patriots dominated the front pages of dailies in New England and elsewhere, the website of the Bay State Banner, the black-owned weekly in Boston, had no mention Monday of the results. Diana Moskovitz, Deadspin: Do The NFL's Anti-Domestic Violence Initiatives Actually Even Exist? "The Rapid City Journal published a regrettable headline and flawed story on Saturday that represents one of the more troubling examples of irresponsible coverage of Native Americans in recent years," the Native American Journalists Association said Sunday, referring to the South Dakota news outlet. "The newspaper has begun to address the problematic headline but further measures should be taken both in the short-term and long-term. "The newspaper's headline 'Did Native students stand for National Anthem?' ran with its top story in the Saturday print edition — the latest in the paper's coverage of how children from the Pine Ridge Reservation became the target of racially charged insults. "The headline fell short of the standards of responsible journalism, as it indirectly suggested that elementary and middle school students could have been responsible for prompting the harassment. The headline was the result of phrasing that was not well thought out on the paper's part, and outcry over the headline has been swift in the Rapid City region and beyond via social media. . . . ."
The statement also said, "The story comes amid otherwise responsible coverage of how one or more people attending a hockey game as guests of a beer distributor verbally insulted students, and sprayed or threw beer at them. . . . It's unfortunate that a single story tainted the coverage of the case for the Journal, especially since the newspaper has been at the front end of informing the public of developments this past week, with both reporting and commentary." Journal Executive Editor Bart Pfankuch told NAJA, "Across the board, the newspaper's coverage has been in strong condemnation of what took place there, including in a strongly worded editorial that ran last week. It called upon all of us, as human beings, to step up and stop racism when it occurs. . . ."
Pfankuch apologized in a signed editorial Monday. "The Rapid City Journal deeply regrets the pain this headline has caused to our community and pledges to continue our efforts to fight racism and other social ills," he wrote. "A story about a Detroit man who commutes about 21 miles a day on foot to and from work has spurred reaction from across the nation, including social media fundraisers that have netted more than $80,000 in donations as of 6:30 p.m. Monday," Bill Laitner reported Monday for the Detroit Free Press. "Because buses don't cover the full distance between James Robertson's home in Detroit and his job in Rochester Hills, he walks about eight miles headed to work and about 13 miles home, five days a week. His story — told by Bill Laitner in Sunday's Detroit Free Press — has inspired hundreds to offer money to buy him a car, pay his insurance and to provide professional help in managing the donations. Robertson said Sunday he was flattered by the attention he'd gotten for his arduous commutes after the Free Press published a front-page story about him — and amazed that complete strangers would respond so generously, some by offering to buy him a new car and others offering to give him one. "Are you serious?' he said to a reporter after hearing of one crowd-funding effort alone that, by early Sunday night, had raised $30,000 — $25,000 more than the goal of the originator, a Wayne State University student. . . ."
As if to underscore that black history is white history, too, more than 100 public television stations plan to air "The Editor And The Dragon: A North Carolina Journalist Takes On The Ku Klux Klan," Kenneth Janken, interim director of the Center for the American South, a co-producer of the film based at the University of North Carolina Chapel Hill, told Journal-isms on Monday. A summary of the film begins, "In 1953, Ernest Hemingway received a Pulitzer Prize for his monumental work The Old Man and the Sea. That same year, the Pulitzer committee also awarded a prize to 32-year-old UNC graduate Horace Carter, editor of the Tabor City Tribune (NC), who was in the middle of a real-life struggle with the Ku Klux Klan in his small town. "Carter earned a Pulitzer Prize for Meritorious Public Service for his reporting on the Ku Klux Klan. Despite receiving death threats against himself and his family, Carter used the editorial authority of the Tribune to protest the Klan's racist rhetoric and vigilantism. Carter's bold reporting and the unwavering integrity of his editorials helped lead to the firstPulitzer Prize for Meritorious Public Service for his reporting on the Ku Klux Klan. Despite receiving death threats against himself and his family, Carter used the editorial authority of the Tribune to protest the Klan's racist rhetoric and vigilantism. Carter's bold reporting and the unwavering integrity of his editorials helped lead to the first federal intervention in the South during that era, and to the arrest and conviction of nearly 100 klansmen. "Horace Carter's story started one July day in 1950 when he witnessed a Ku Klux Klan motorcade drive through town. Carter was a journalist at the time, and he began doing Klan-related reporting for the Tabor City Tribune. He continued writing for three years. The filmmakers have collected some of those original articles. . . ."
WUNC-TV, based at the university, is the originating station. Meanwhile, as part of its programming during Black History Month, New York's Schomburg Center for Research in Black Culture is hosting "a Wikipedia edit-a-thon where Schomburg staff will train participants on how to properly edit Wikipedia and then set them loose on the free encyclopedia to create and improve articles relating to black history," according to Fast Company. One of several articles that Maira Liriano, Schomburg's associate chief librarian, said she hopes will be added to or improved in Wikipedia, is about Roi Ottley, "a journalist and author born in New York in Harlem in 1906," the article says. "He was a journalist for the Chicago Tribune during World War II and is considered the first African-American war correspondent for a major news outlet. He's also said to be the first African-American to interview the Pope. A book he wrote in the '40s, called New World A-Coming, was very popular. 'There is information about him on the web, but there's nothing about him in Wikipedia,' says Liriano. . . ."
Jarvis DeBerry, nola.com | the Times-Picayune: What's with these Confederate-loving experts on Martin Luther King? "Warren Sapp has been terminated from NFL Network following his arrest for soliciting a prostitute and assault in Phoenix early Monday morning," Richard Deitsch reported Monday for Sports Illustrated. "The news of the arrest was first reported by TMZ and ABC 15 in Phoenix. Sapp has been an analyst with the network since 2008. . . ."
"This morning ABC News put out the call for its quadrennial Campaign Digital Reporter program," Chris Ariens reported Monday for TVNewser. " 'The Campaign Digital Reporters are our road warriors, the people who help bring the drama, excitement and key moments of the campaign to our audiences,' writes ABC News VP and managing editor David Reiter. This year ABC plans to embed with the candidates as well as in . . . the early caucus and primary states. The reporters 'start by covering small meetings in living rooms, and finish in stadiums with thousands of cheering faithful. They are present for soaring oratory and stumbling gaffes,' Reiter writes. . . ."
"The cable sports giant has launched One Nación, a bilingual web site that aims to integrate ESPN content relevant to U.S. Hispanic sports fans and serve as a hub for content in both English and Spanish from ESPN and ESPN Deportes,"medialifemagazine reported on Monday. "The site will feature bi-weekly video segments hosted by ESPN Digital media's Antonietta Collins and ESPN Deportes' Alfredo Lomeli, as well as the video series 'No Hablo Español,' focusing on the perspectives of second- and third-generation Latinos. . . ."
"A group of female leaders in public media has formed a committee to address issues of gender inequality in the executive ranks of public television and radio and is announcing a mentorship program this month . . .," Dru Sefton reported Monday for Current.org. "Fourteen years after its launch, mun2 says goodbye this Saturday night," Veronica Villafañe wrote Friday for her Medial Moves site. "But right at midnight, February 1 it comes back to life as NBC Universo, a newly rebranded cable channel boasting a new logo, the NBC trademark peacock and a reworked programming grid. . . ."
The New Yorker won National Magazine Awards "for general interest, fiction, and essays and criticism, the latter award going to Roger Angell for his moving look at aging," Michael Calderone reported Monday night for the Huffington Post. "Angell, 94, beat out Ta-Nehisi Coates' much-lauded 'The Case for Reparations,' in The Atlantic, to win his first National Magazine Award. . . ." Vogue was named magazine of the year. On Thursday, Donna M. Owens reported for the Baltimore Sun on Coates' return to his native Baltimore to speak at Loyola University Maryland. The comScore, Inc., research company Monday responded with additional figures on the popularity of individual African American-oriented websites, reported in Friday's Journal-isms. Atlanta Black Star recorded 713,000 unique visitors for 2014. Its average monthly totals represented an increase of 19 percent over December 2013. ColorLines recorded 109,000 unique visitors, a decrease of 29 percent over December 2013.
" Some of the nation's best known, award-winning Latino journalists as well as the current and former presidents of the National Association of Hispanic Journalists (NAHJ) are among the speakers that will headline the bilingual Hispanic Journalists Showcase of Hispanicize 2015," the conference announced on Wednesday. "The Hispanic Journalists Showcase of Hispanicize 2015 consists of a multi-faceted, multi-day platform that includes in-depth social media training for reporters, a day devoted to exploring issues that impact Latinos in media and the second annual Media Entrepreneurship Boot Camp for Hispanic Journalists. This year's Hispanic Journalists Showcase is being curated by chair Hugo Balta, immediate past president of the NAHJ and Senior Director, Multicultural Content at ESPN. . . ." NAHJ has secured 400 free, all access passes for working journalists who wish to attend, the groups announced. The event is scheduled March 16-20 in Miami. In Ecuador, "Far from laughing along with those who poke fun at him on social media, President Rafael Correa has created a website and Twitter account to marshal digital counterattacks by his supporters against the 'defamers,' . . . " Gonzalo Solano and Frank Bajak reported Monday for the Associated Press. " 'For every lying tweet that they send out, we will send 10,000 that are truthful,' Correa said Saturday in his weekly TV appearance. . . ."